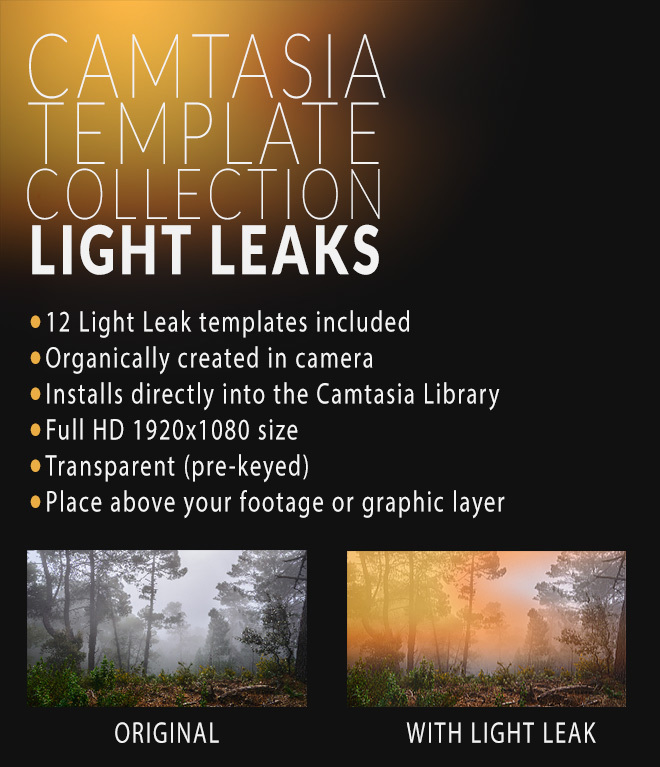 We are proud to present our latest template collection for Camtasia, Light Leaks! The collection includes 12 different light leak effects that can be installed and used directly from the Camtasia Library. Just install and drag-and-drop from the library to your Camtasia timeline. Please the light leak above your image or footage and adjust speed and opacity for the cool effect you want to achieve. It works on Camtasia 8 (all versions) and Camtasia 9.04 or later. Help file is also included. The Light leaks are delivered as transparent MOV files (prekeyed). You may need to have the Quicktime codec installed for MOV to work properly. We recommend the free K-Lite Codec Pack, basic version.